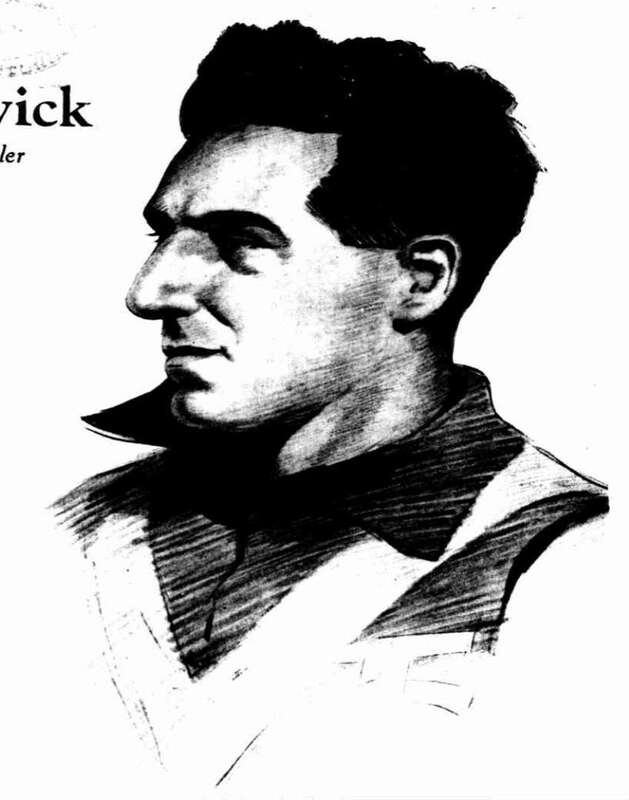 Leonard Frank Reynolds (1897 - 1939) was not known as a football illustrator. 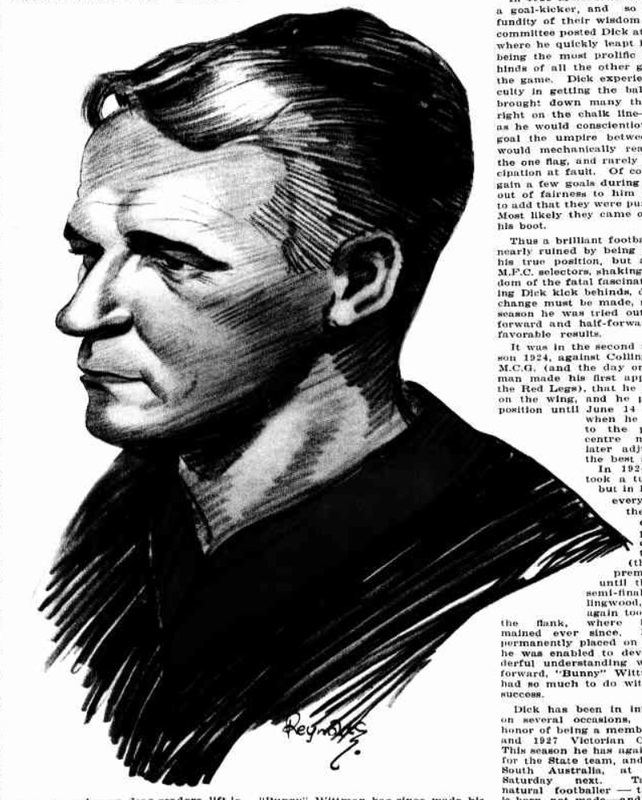 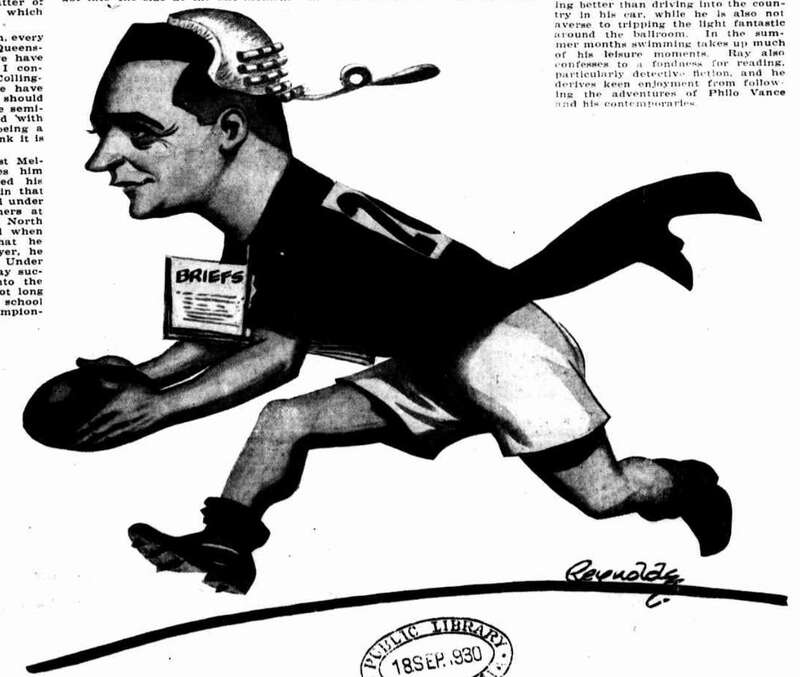 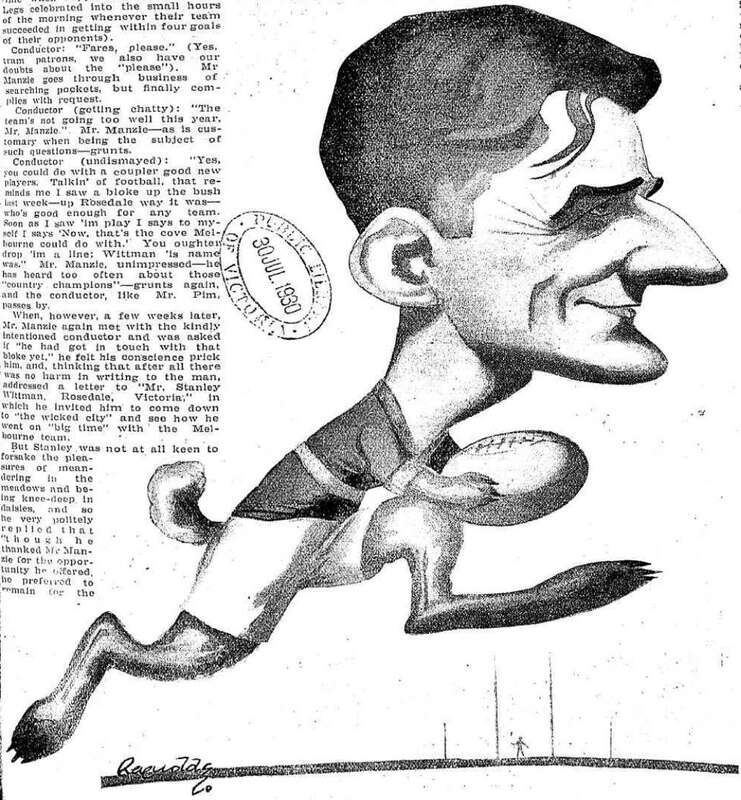 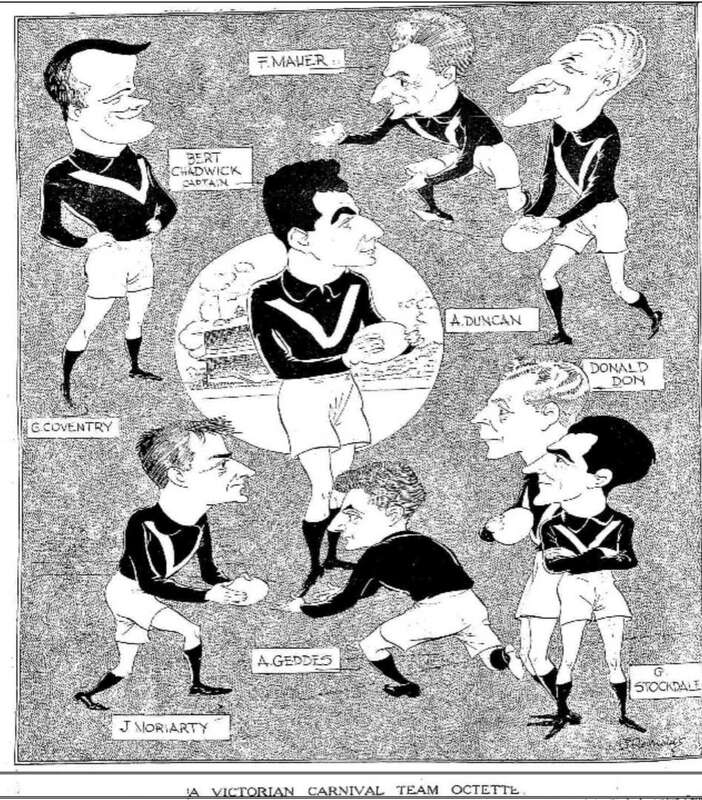 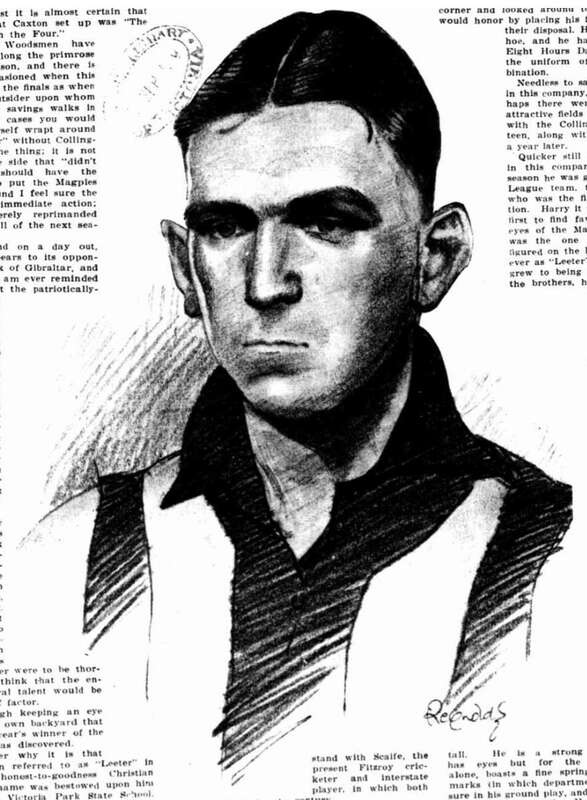 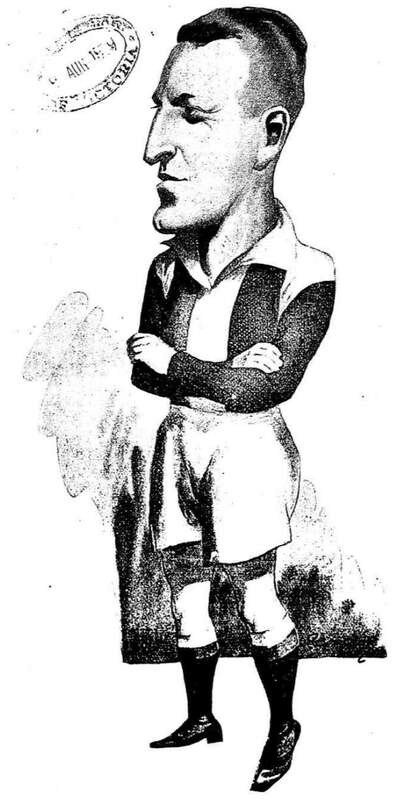 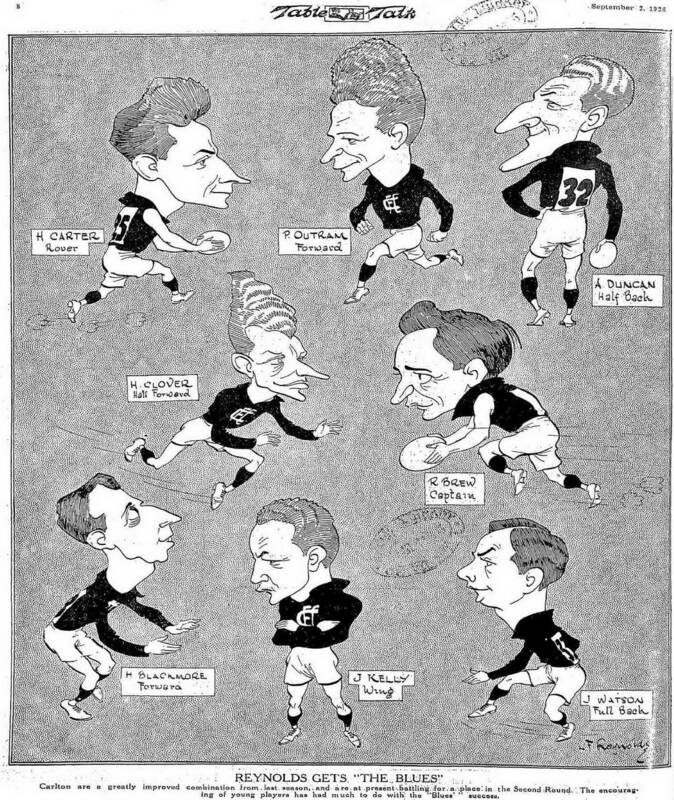 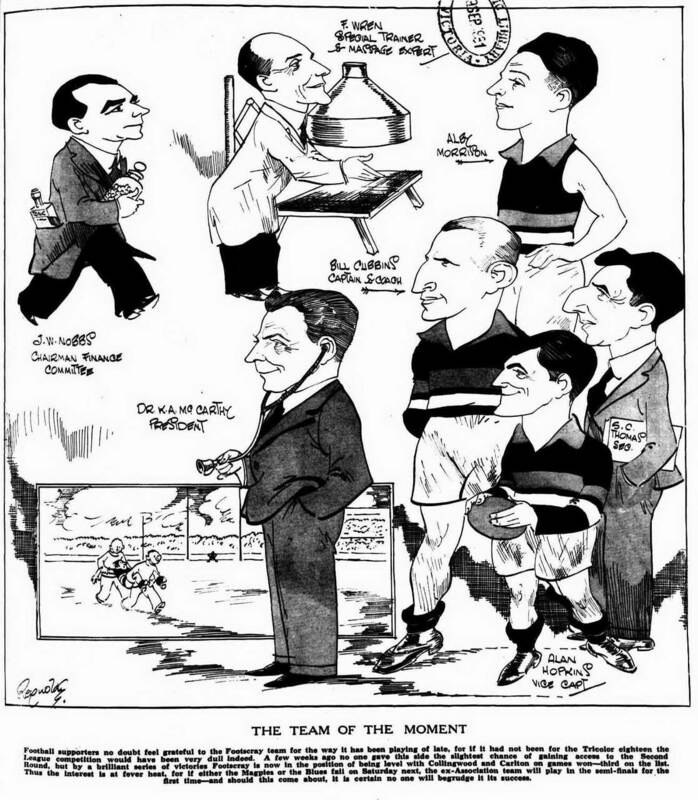 But through his series of "Prominent Personalities" he drew a number of leading footballers of the late 1920's. 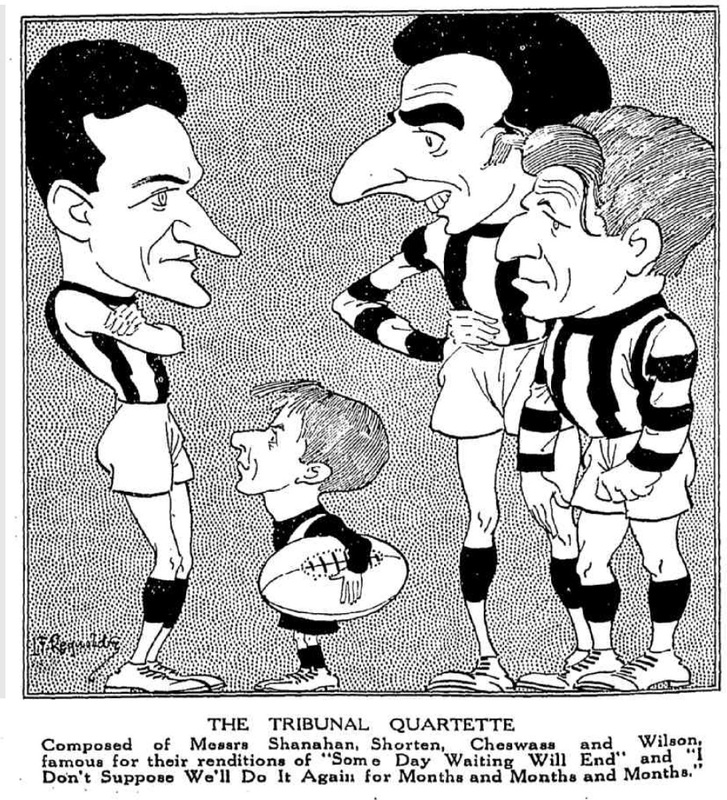 These cartoons are a delight to the reader. 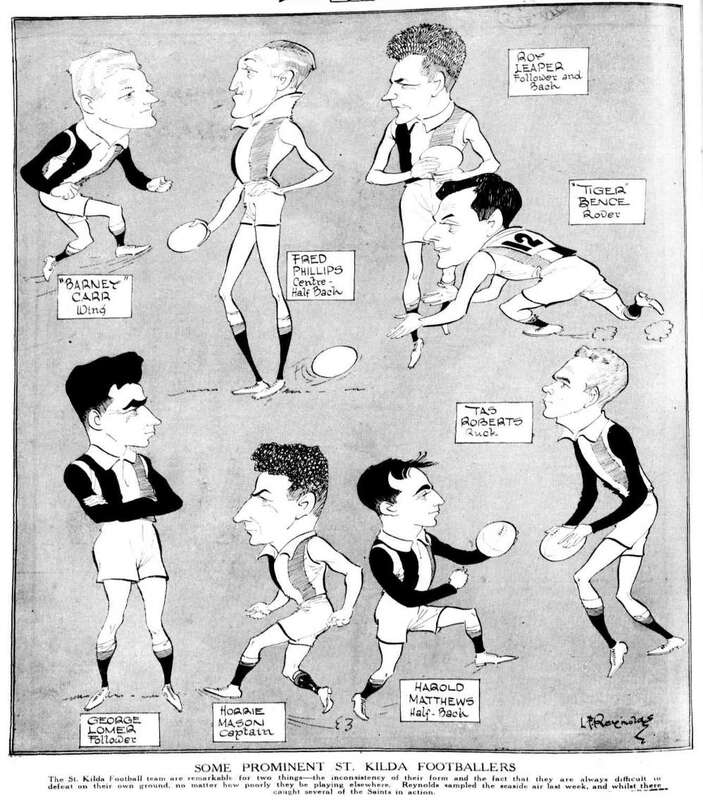 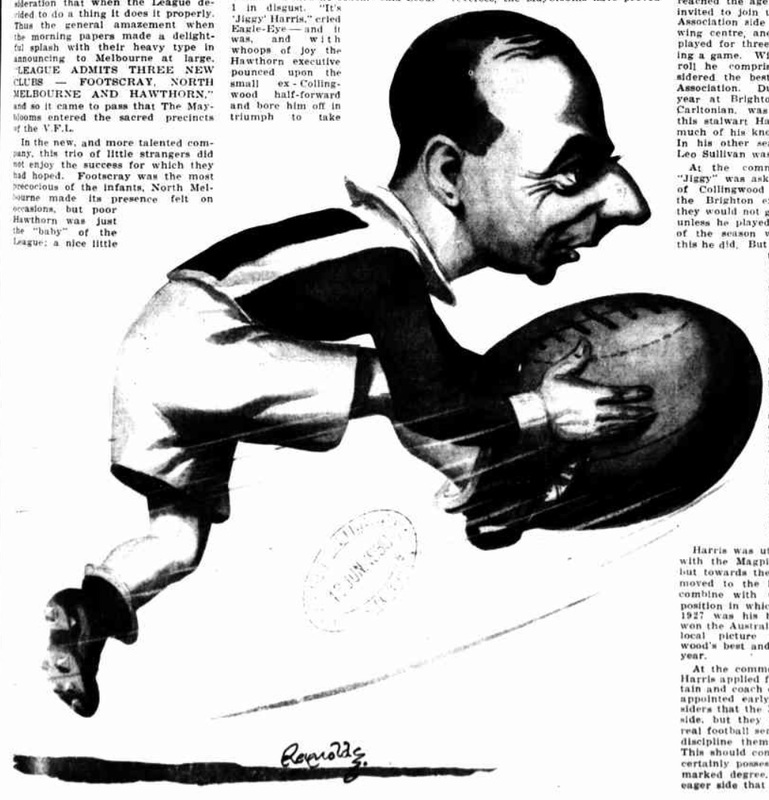 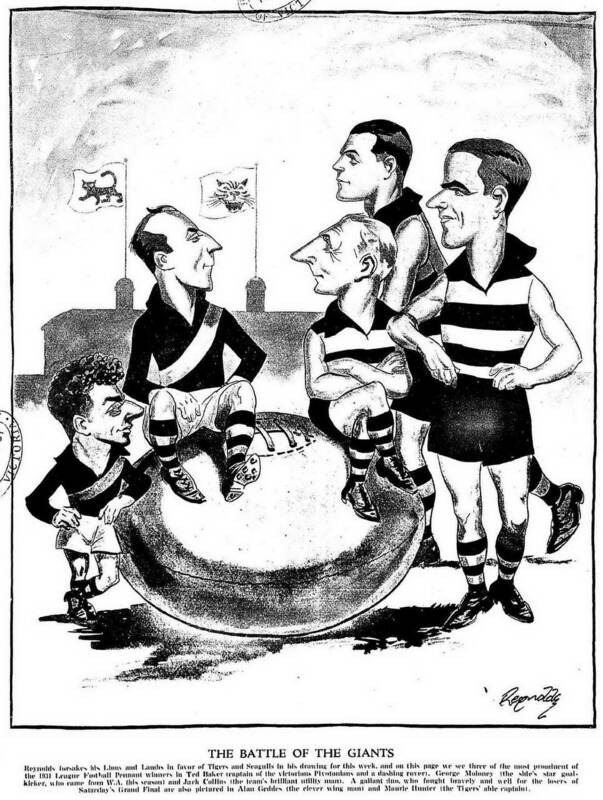 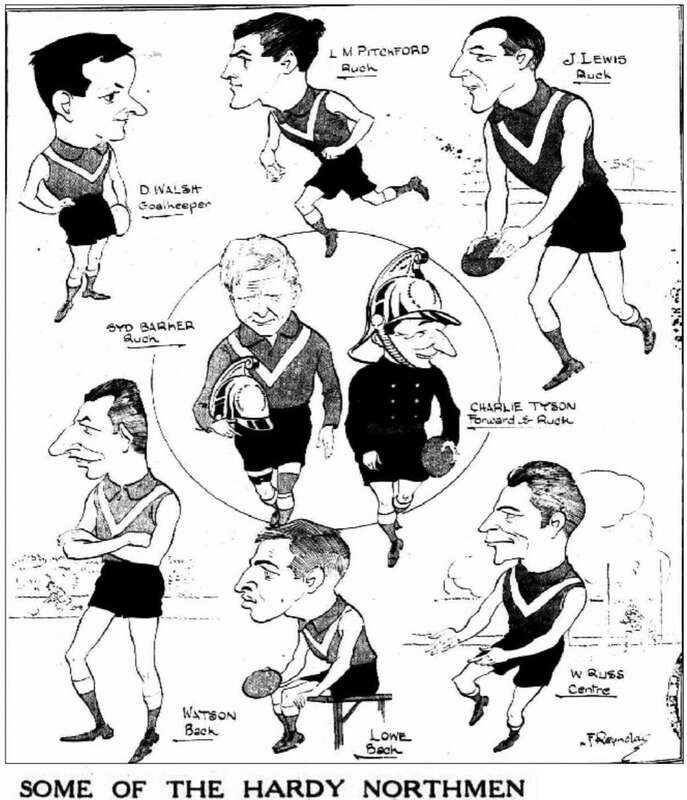 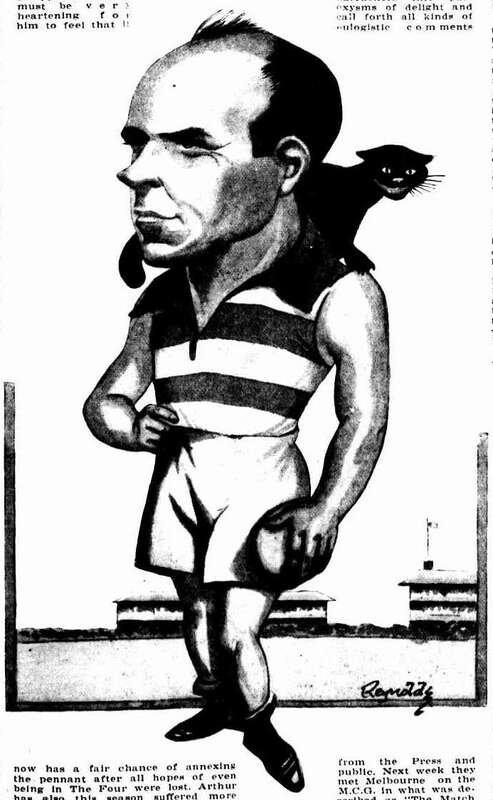 L.F. Reynolds also drew the Mr Melbourne cartoon strip, taking over from Jimmy Bancks in 1925. 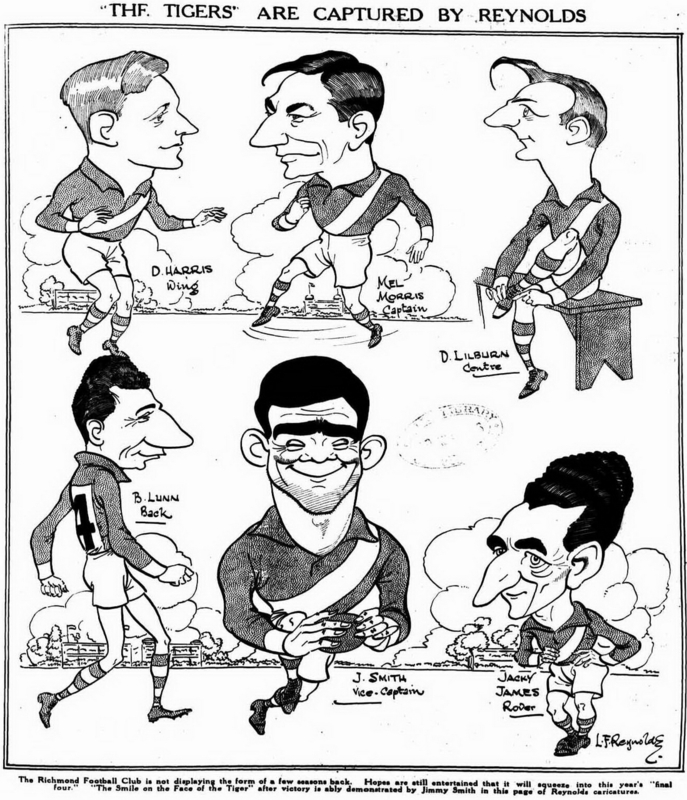 Len Reynolds died tragically young in a motor car accident, but his cartoons continue his name. 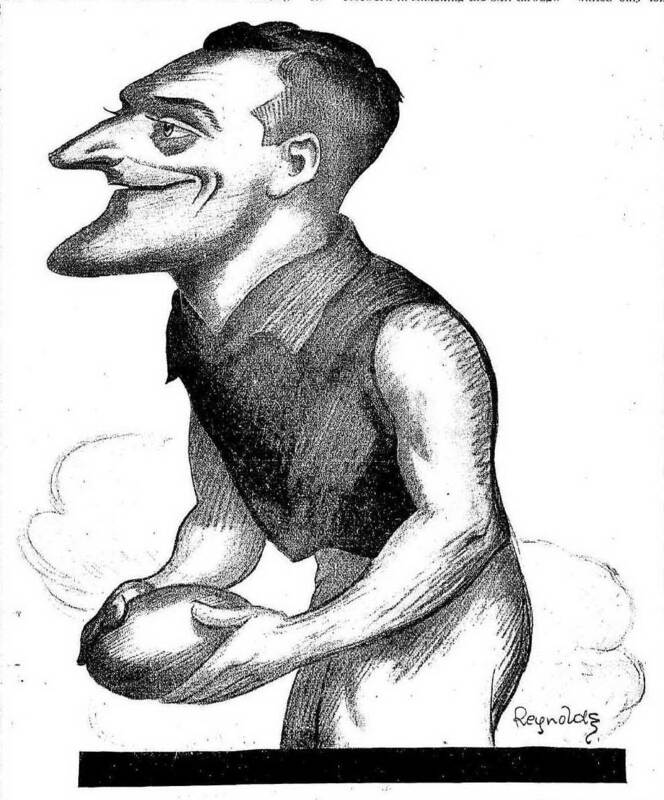 Little is known about Len Reynolds, a Tasmanian cartoonist who made his name in Melbourne, before dying tragically at the early age of 44. 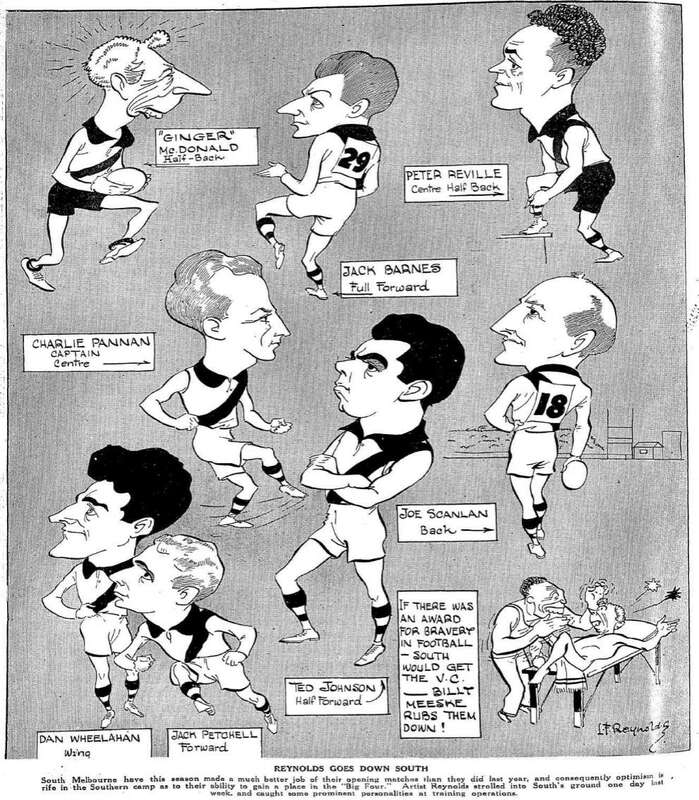 During 1926-27 Reynolds produced a series of cartoons for the Melbourne based weekly newspaper 'Table Talk', with each drawing containing a selection of sketches. 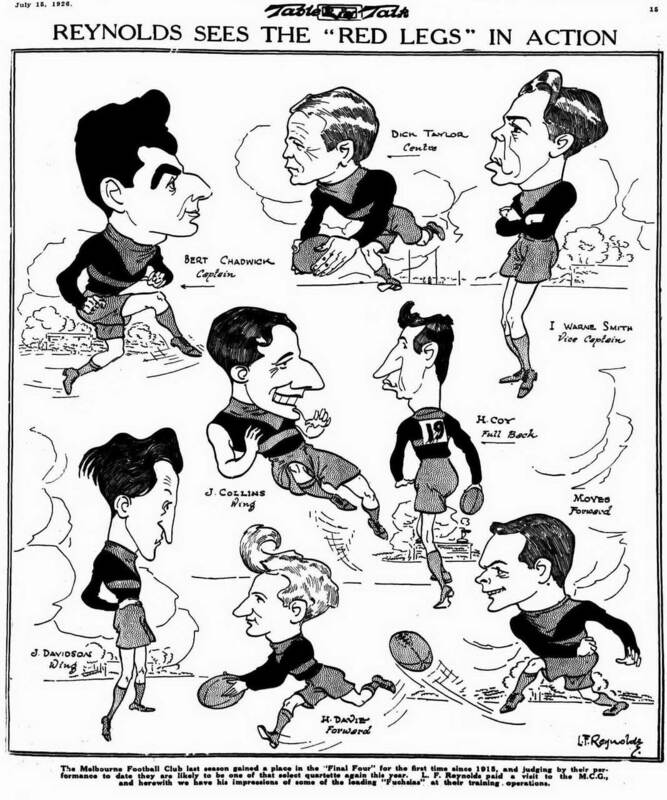 Most of these group sketches had a football theme. 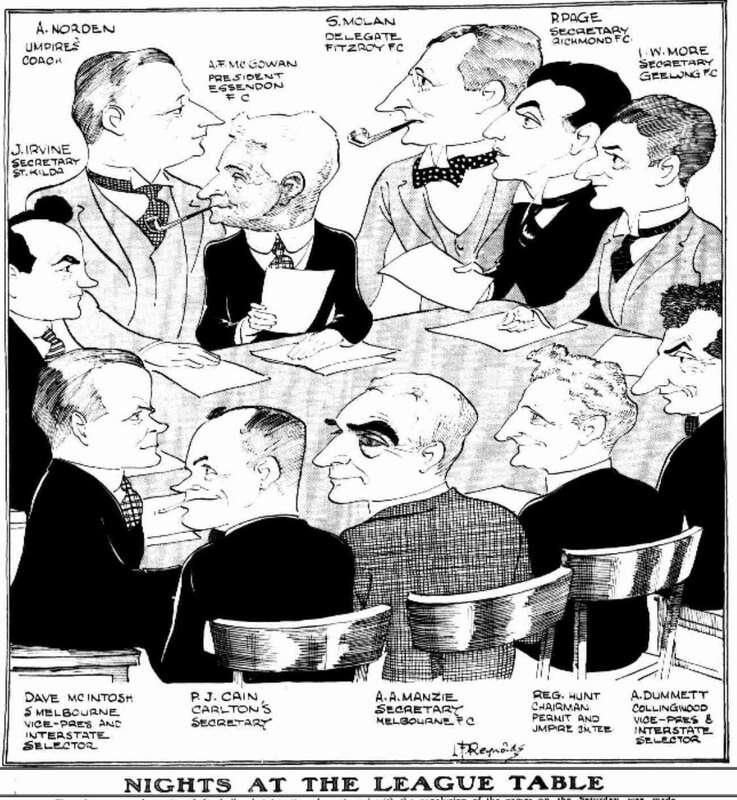 After these initial sketches, Reynolds produced a series entitled "Prominent Personalities" also in 'Table Talk'. 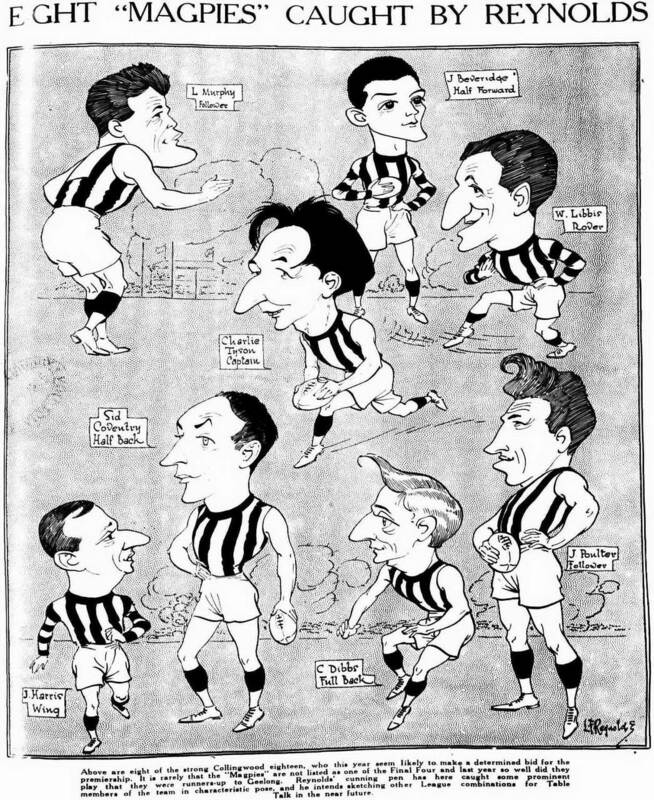 This series produced a sequence of beautifully drawn illustrations on major Victorian personalities from politicians, to artists and also sportsmen. 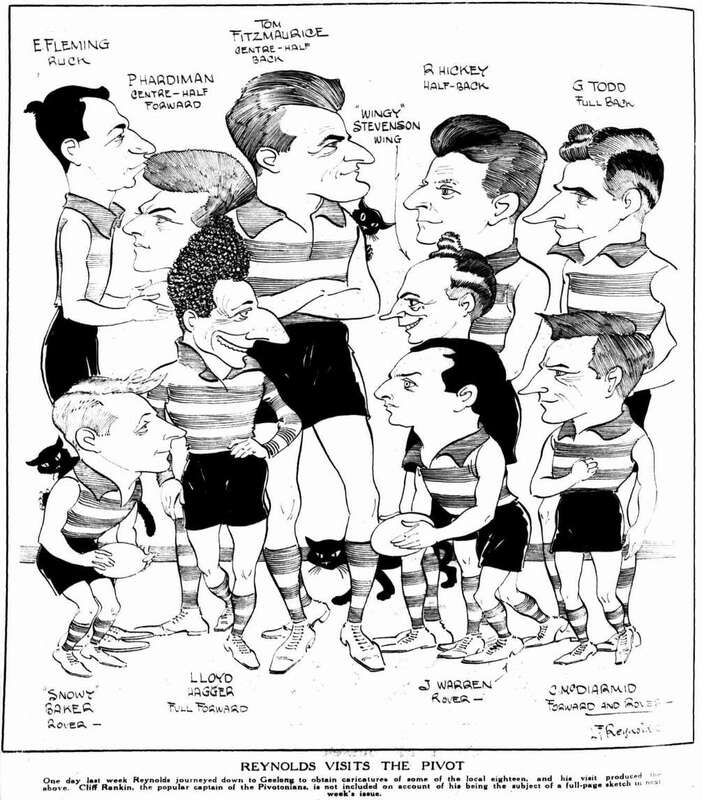 The quality and skill of Len Reynolds can best be seen through this series. 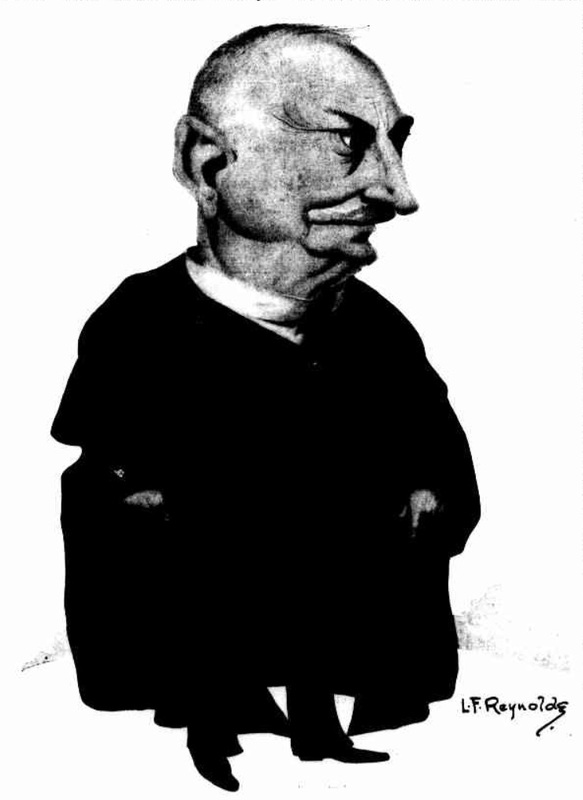 Indeed, Australian Impressionist artist Arthur Streeton thought highly of this series. 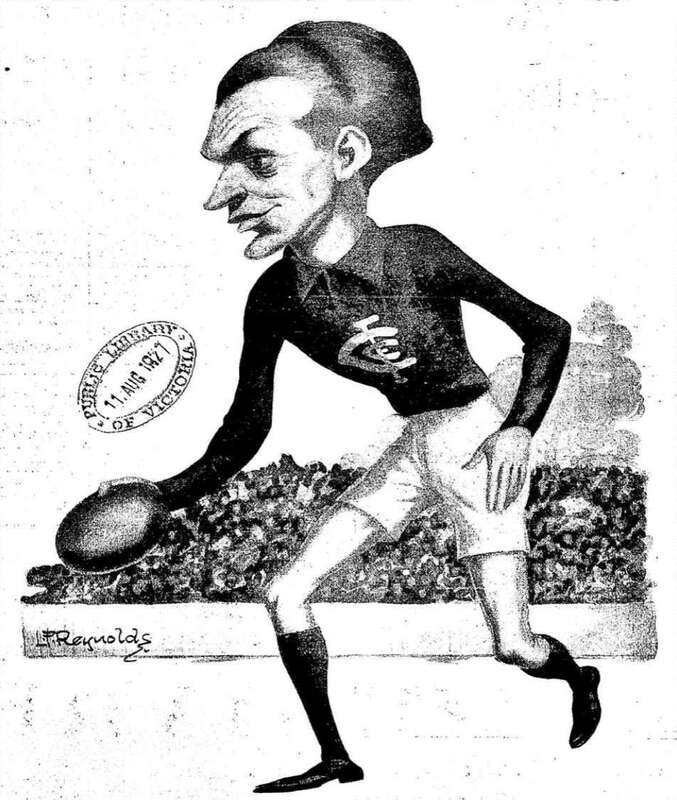 Writing a critique of a show by Ray Whiting, Streeton wrote. 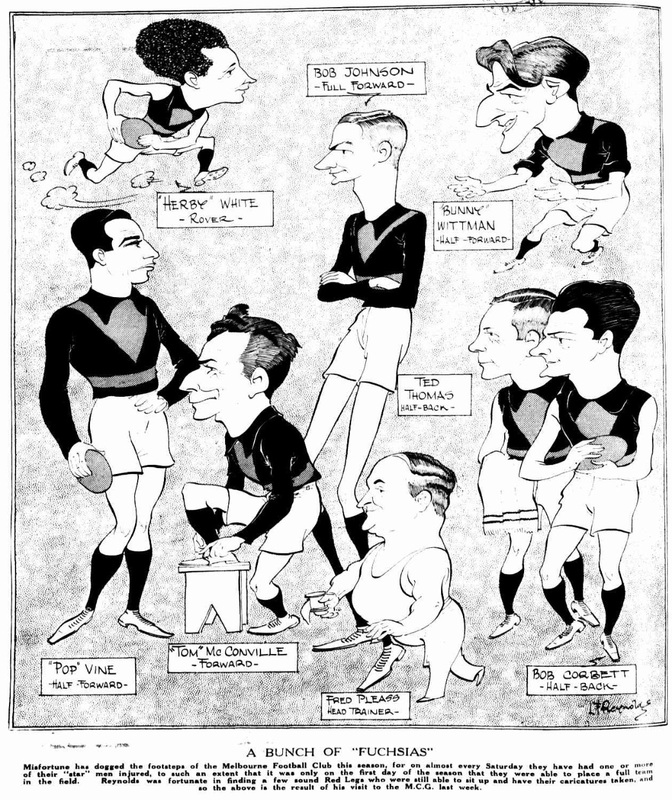 Streetons own Australian Rules painting, 'The National Game', is part of the Collection of the Art Gallery of NSW. 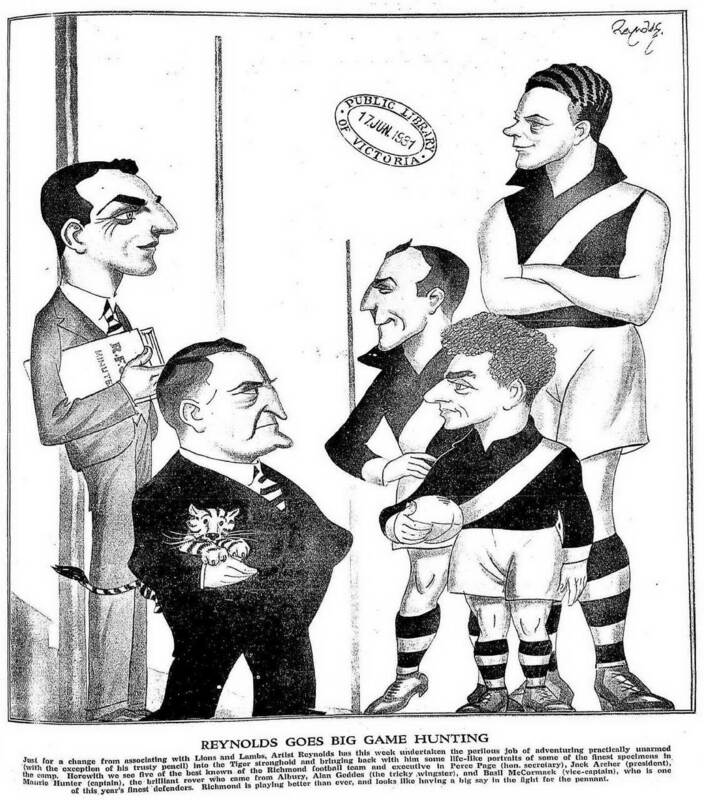 Apart from newspaper illustrations, Reynolds drew cartoons for advertisements including 'The Lighter Side of Lawn Tennis' for Barnett Glass in 1927. 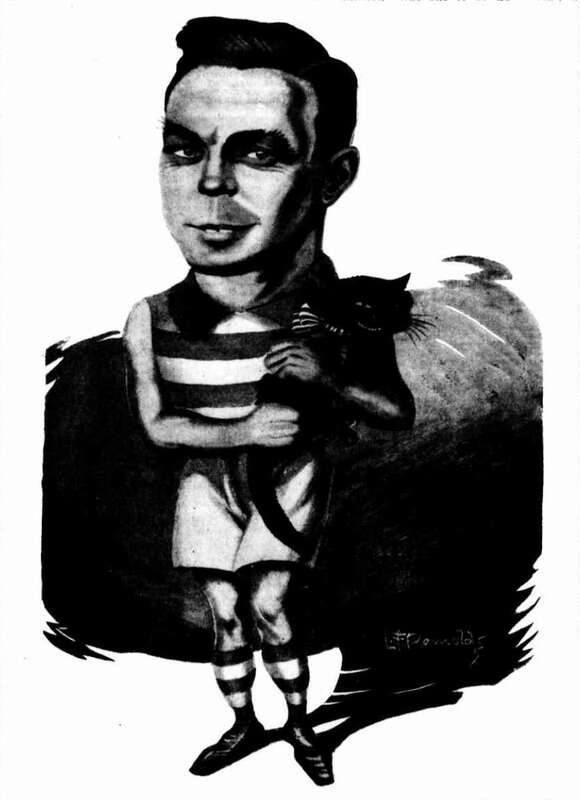 Reynolds regular illustrations stopped appearing in 'Table Talk' around 1930, though a series on dog breeds did later appear. 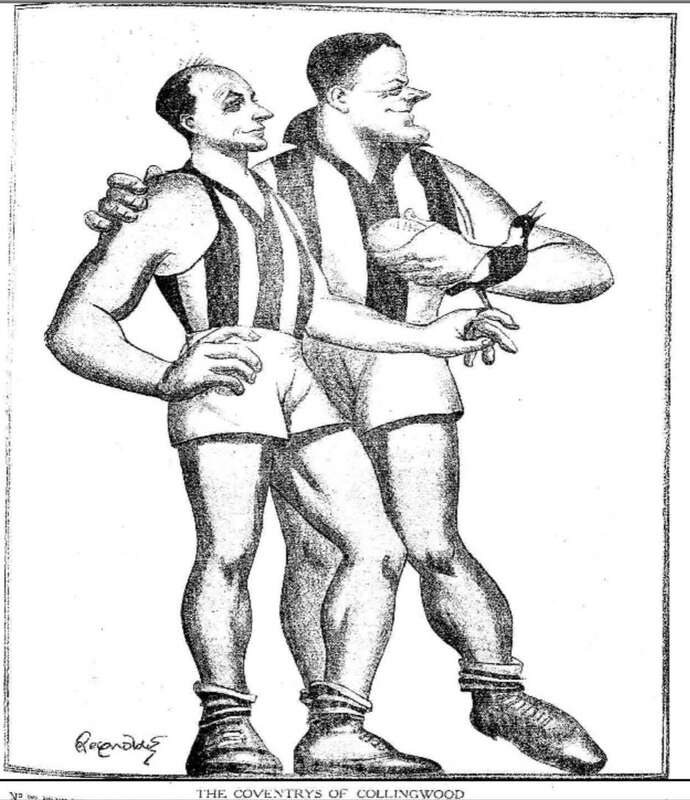 It requires further investigation for when Reynolds stopped doing the 'Mr Melbourne' strip. 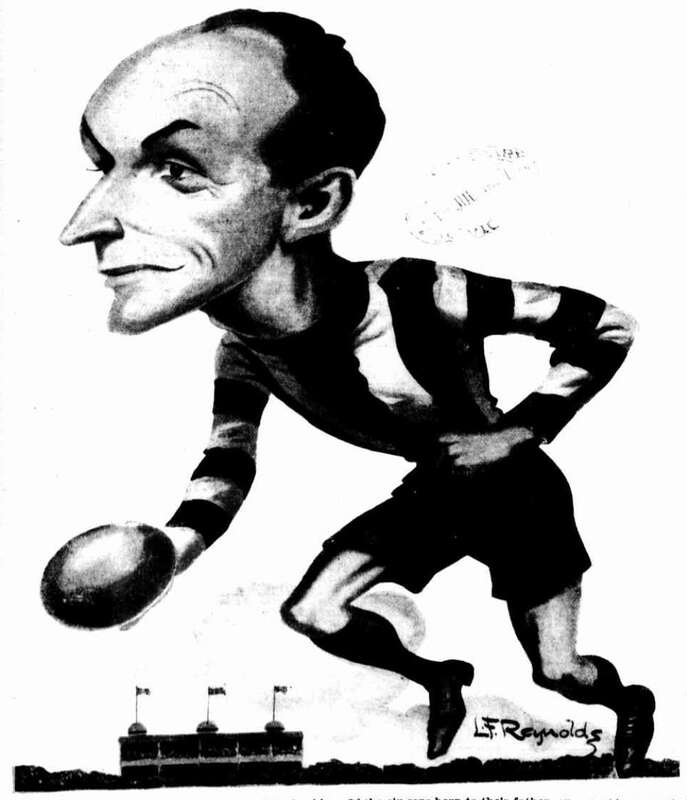 Tragically in August 1939, Len Reynolds died when his car went off a cliff in Beaumaris in Melbourne. 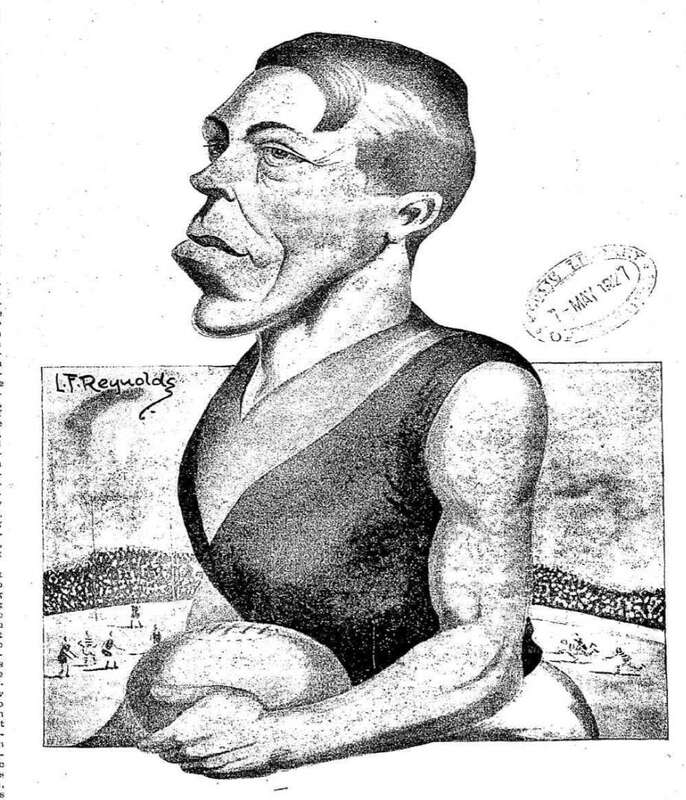 Further examples of Reynolds work will be found in the Sun News Pictorial which is not yet available online. 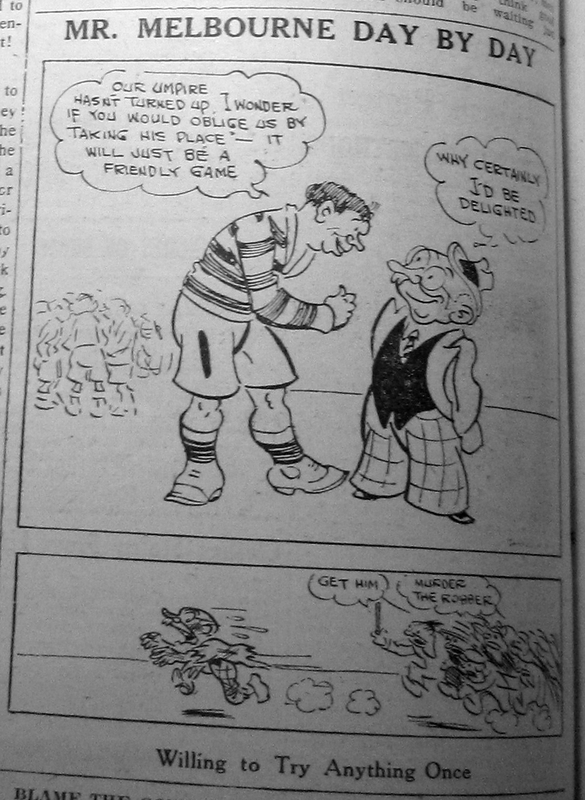 Further examples of his work will be found in that paper. 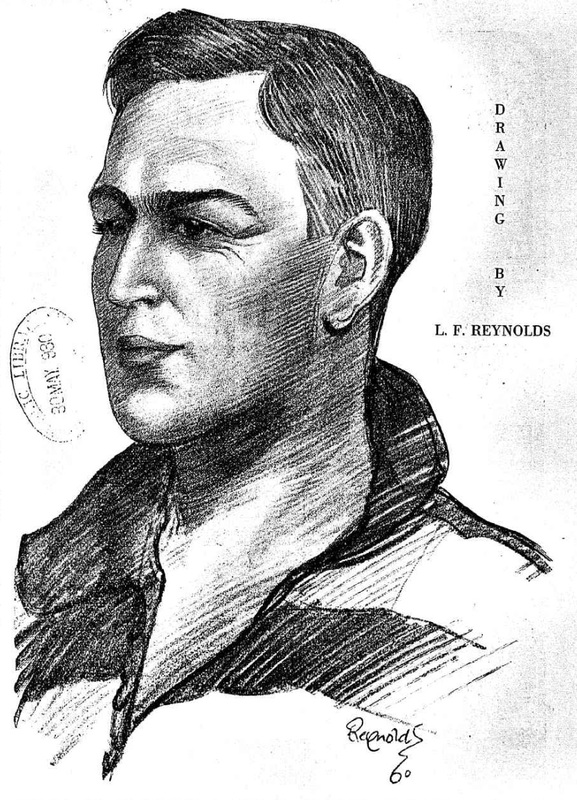 Len Reynolds died in 1939. 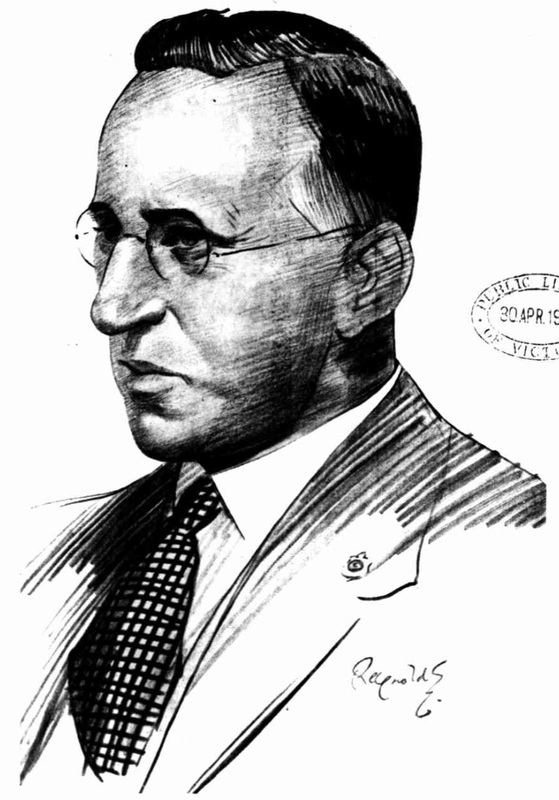 His works became public domain in 1989, 50 years after his death. 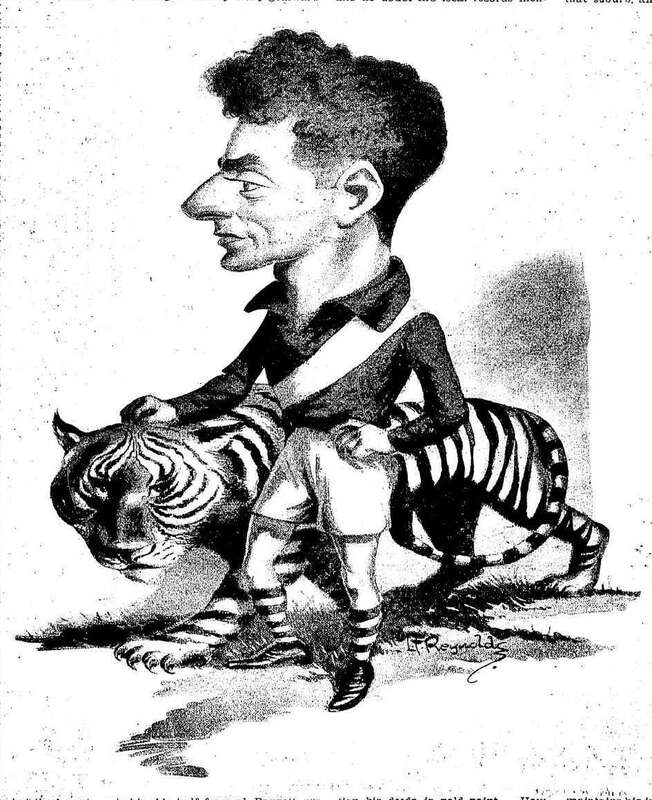 Under Australia's current copyright laws, works for artists who died after 1954 have copyright extended to 75 after their death.